As of 7/1/10, modules are no longer stocked at $14.99. Modules can be built for special orders at a price of $29.99 each with a 10 day lead time. I no longer carry stock of the raw Sensirion SHT sensor, so they must be purchased per order from Newark at current market pricing. Use email at bottom of page for special orders. The WBA-TH1M Module makes it very easy to use Sensirion's SHT11 Digital Temperature/Humidity Sensor in your microprocessor controlled projects. The two-wire digital serial interface is simplified and sample code is available for several microprocessors. 2) Inline protection resistors for the data line. This protects the processor and WBA-TH1M in case they try to drive the line into opposite states. Not all microprocessors include line protection on their IO pins. The inline resistor in the clock line is for increased stability of the clock signal since you can use such a wide range of clocking frequencies. 3) I used a 1uF cap so that apart from the desired noise reduction, it also reduces VCC ripple effects to the device. Connections are made via a 4 pin 0.100" header as well as solder pads for wire attachment. There is a label on the back side that denotes the pinout. 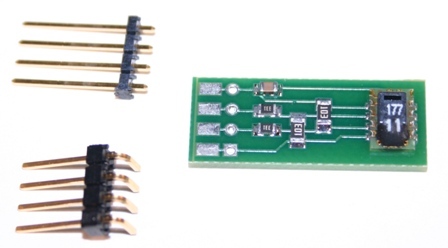 The module comes with a 4 pin right angle and straight header (unsoldered) to allow user versatility. This allows for top, bottom, and vertical mounting. The module design allows for use of the Sensirion SF1 filter cap (if the cap's posts are removed) so that the sensor is IP67 rated for water, dust, and other contaminants for harsh conditions. Modules are manufactured and inspected to IPC-610 specifications in an ESD controlled manufacturing facility. They are tested against a reference module under a 10 degree swing cycle.